Today I'm sporting some free hand Nyan Cat nails! I'm kind of a geek at heart. I love internet memes in all their fabulousness. If you're not sure what Nyan Cat is please educate yourself on its ridiculous ridiculousness here. The most fun is had when checking out the 'flavors' of Nyan. 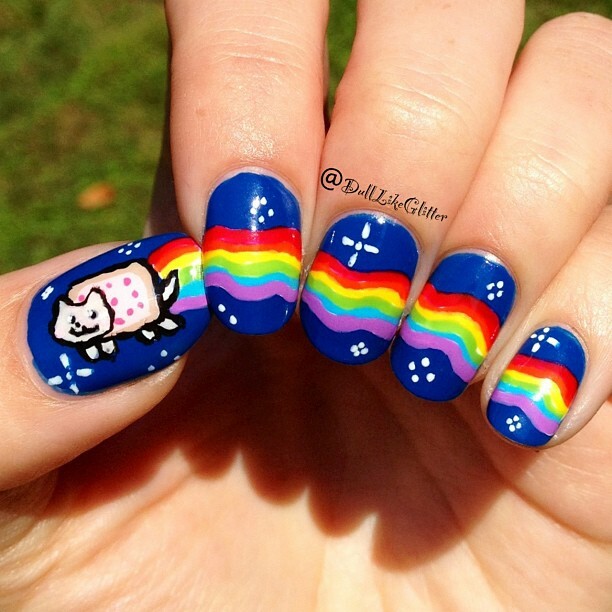 For an inspirational contest on Instagram I did Nyan Cat nails inspired by the internet! I used Butter Londons Blagger as the blue backdrop then used Essie Blanc to draw a white outline of the rainbow and Nyan Cat. I painted the pop tart base in OPIs Don't Pretzel My Buttons and did the frosting in Ciatés Strawberry Milkshake. The sprinkles are Essies Off The Shoulder. The cat fur is OPIs Moon Over Mumbai using China Glazes Liquid Leather for the outline details and Blanc again for the high lights. The rainbow was painted usind Essies Really Red, Essies Meet Me at Sunset, China Glazes Sunshine Pop, China Glazes Gaga for Green, Juleps Claire and Essies Play Date. Finally stars were painted using Blanc again! I'm in love with these cuties. Your blog is really fun! You do beautifully intricate nail art. I would love a way to follow you besides email. You can find me in Instagram @dulllikeglitter which is where I post most of my work and also on facebook under the artists page Saving the World One Nail at a Time. The facebook page is a little behind but I am updating it soon. I am planning to post some tutorials on youtube under the name DullLikeGlitter and also will have some false press on nails available in my etsy store http://www.etsy.com/shop/DullLikeGlitter. Feel free to check out and follow my work under any of those venues!